How have I not yet posted the Ackee and Saltfish recipe on my blog?! This is Jamaica’s national dish and I absolutely love it. We eat ackee and saltfish often at breakfast time though the meal is quite filling and so is often served for lunch as well. 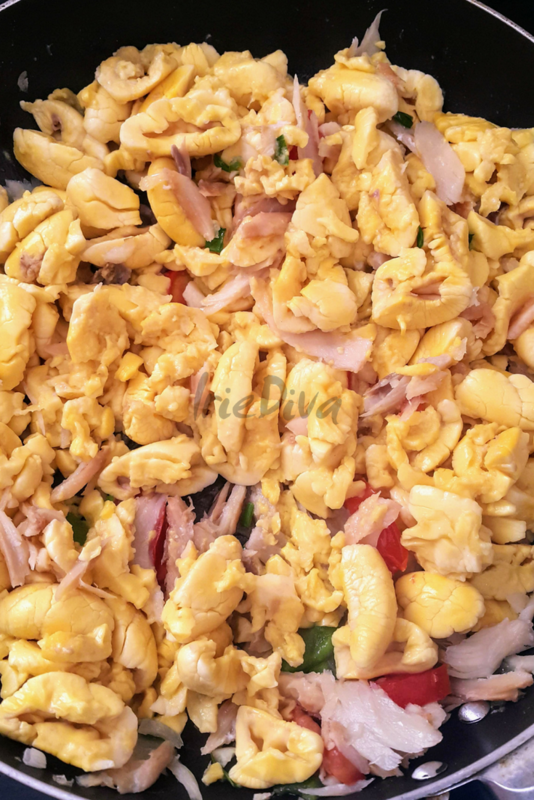 I’m an ackee master and today I will give you my simply delicious fool-proof way to make ackee and saltfish perfectly every time, not mashed and not over-seasoned. Ackee is a fruit that grows on trees in pods. It was brought over to Jamaica from Africa during the slave trade and is prepared as mainly a breakfast dish here in Jamaica. 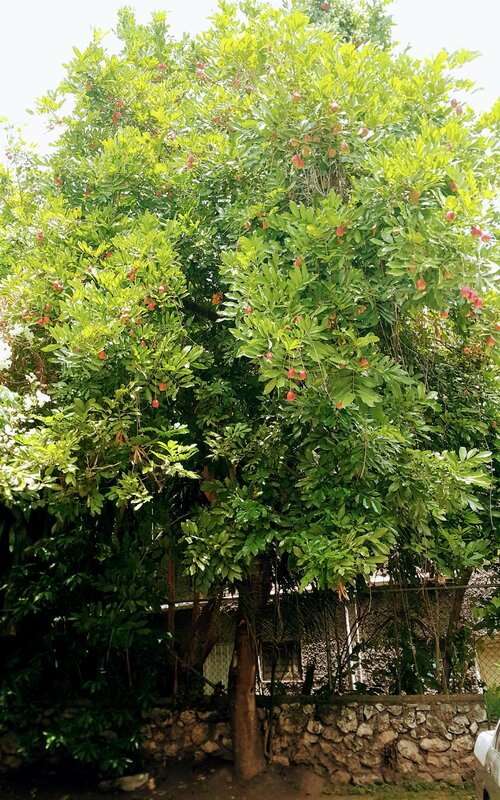 Here’s an image of an ackee tree. Fun fact: Ackees are poisonous if not handled carefully! I just took these pictures outside my apartment. 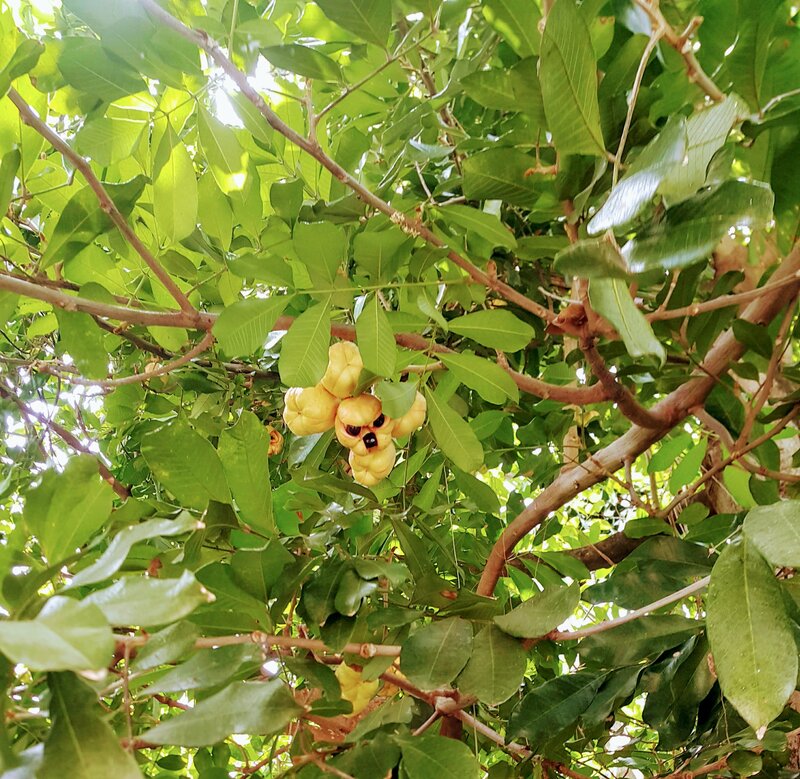 Ackees grow in pods that must be left to open on the tree as seen in the above image before they are picked to be eaten. If not, they’re poisonous! 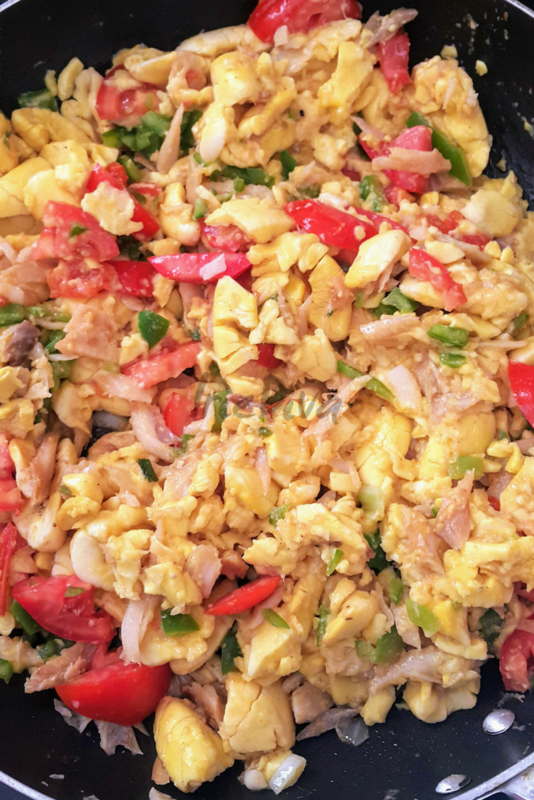 What does ackee and saltfish taste like? 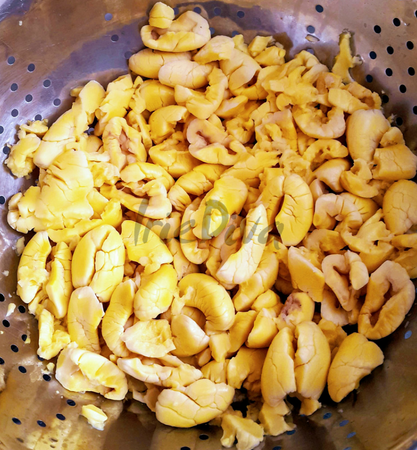 It’s been said that ackee itself doesn’t carry a strong taste and so that’s the reason it’s paired with strong flavours such as saltfish or also popularly with corn pork. Some say ackee tastes a little like eggs. I know it looks like scrambled eggs when prepared but tasting like eggs is a stretch to me. Ackee is soft and has a buttery flavour that’s too delicious to not try. It’s funny, when I was a kid I was not a fan but I have somehow convinced munchkin that it’s delicious and she loves it just as much as I do. It must be my recipe. There’s a science to preparing ackee so that it comes out still intact and not mashed to a sloppy mush. You must boil your ackee first to get rid of any toxins left in the fruit after it’s harvested but some people boil it too long so the final product is a mess. My recipe is simple and timed perfectly so that you won’t run into this. I purchased my ackee from a roadside market stall. One of the great things I love about living on an island. Fresh food readily available on the roadside. I also got this already roasted and peeled breadfruit from the same stall to pair with my ackee and saltfish. Making ackee and saltfish can be a labour of love with all the steps involved so I like to have my side dish already prepared. If you’re using ackee from the tree, remove the flesh from the pods. Remove the black seed inside each peg and clean the inside of the red stuff that’s in there. Again, why I love to buy it semi-prepared on the roadside. They usually clean the ackee and sell it bagged just like you see in the above image. This recipe can also be made with canned ackees. This particular Grace brand I have used with success before. Some canned ackee comes out too mushy but this one was just right. Get it here on Amazon. As mentioned before, you’ll want to blanch or scald your ackee for a few minutes before sauteeing so that any leftover toxins are removed from the fruit. To do this, follow this exact method so that your ackee’s flesh remains firm. Bring a large pot of water to a vigorous boil. Add your ackee and allow the water to come back to that bubbling boil. Your ackee will begin to rise to the top like so. Once the water is boiling vigorously again, set a timer for exactly two minutes. Allow the ackees to boil for just two minutes more then remove from the pot altogether and leave it to chill out in a colander. It’s at this point that you can freeze your ackee in an airtight container if you’re not going to cook it right away. 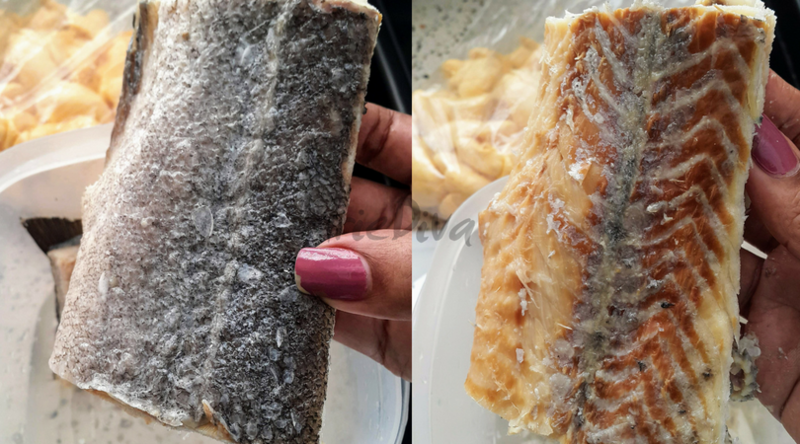 Maybe you’re a typical Jamaican traveller and about to freeze and package it up to take to your Jamaican friend abroad. Notice how everything is still firm and plump. Yummy! 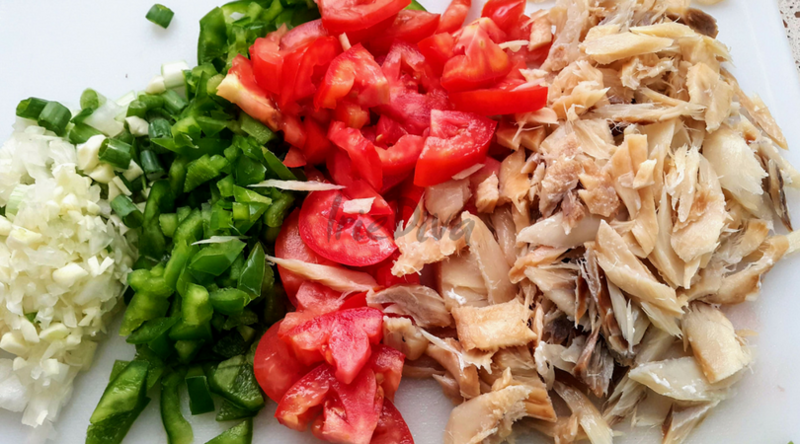 Now it’s time to prepare your saltfish. 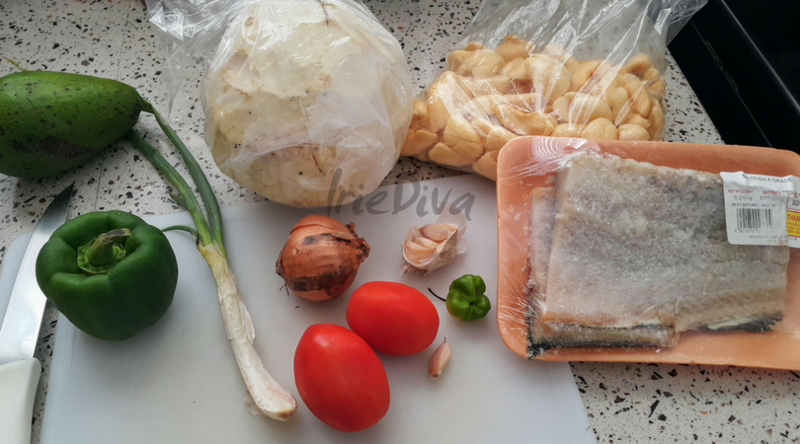 Boil your saltfish for at least 10 minutes to remove the extra saltiness. Once boiled, leave it to soak in tap water to get to room temperature so that you can handle it. You’ll need to clean off the scales and remove it from the bones so you can pick it up. Like so. Now, you’re ready to cook! Add the garlic and onion to some coconut oil in a pan and get that going until fragrant. Then add your saltfish and just a bit of the rest of the seasoning. I like to save some for after I’ve added the ackee so they’re still intact and flavourful. Add the ackee to the pot. At this point, I add my favourite powdered seasoning and some extra black pepper. 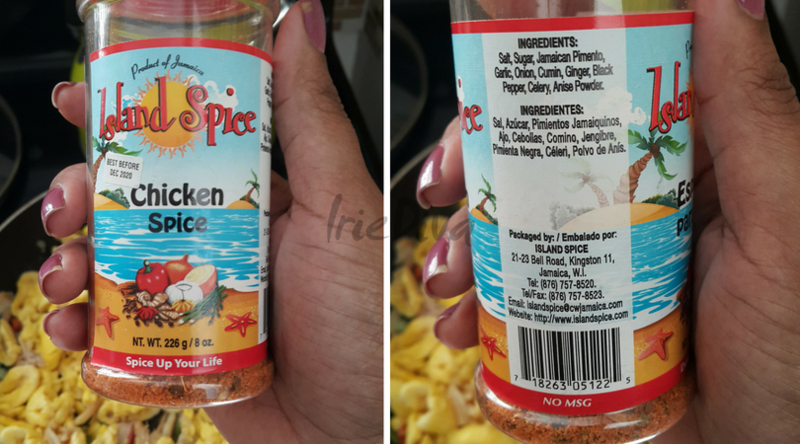 I don’t add any extra salt since the saltfish is plenty salty still and this seasoning also has salt in it. It’s available on Amazon, you can get it here. I use this seasoning in EVERYTHING! It makes everything delicious. When I’m not using it, I’m using the jerk variety instead. Get that one here. Add the rest of your seasonings and mix all this together gently. Allow to simmer on low heat for 5-10 minutes so that the flavours can blend together and the ackee sweats and springs a little juice in the pot. All done! Served here with slices of roasted breadfruit and pear! Or what Americans call avocado. What a delight. You can serve this with pretty much anything. Boiled potatoes, yams and green banana, rice and peas or even with simply some steamed veggies if you’re on a low carb diet. The only thing my plate was missing was some ripe plantains but I was pooped. 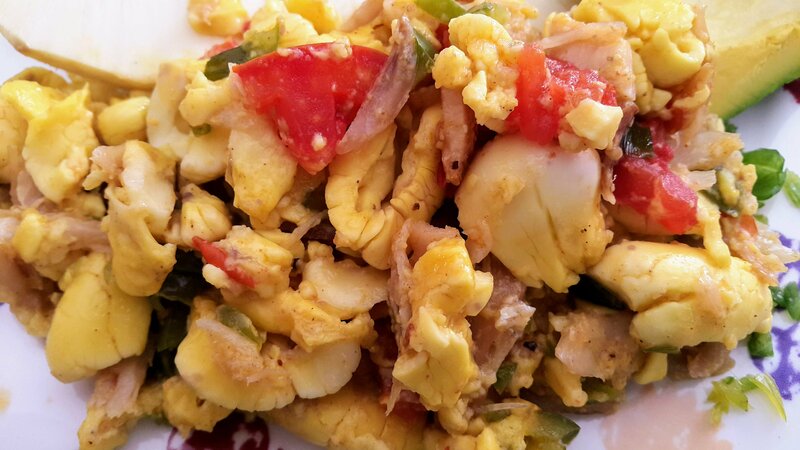 Ackee and saltfish has a lot of steps but it’s so worth it! 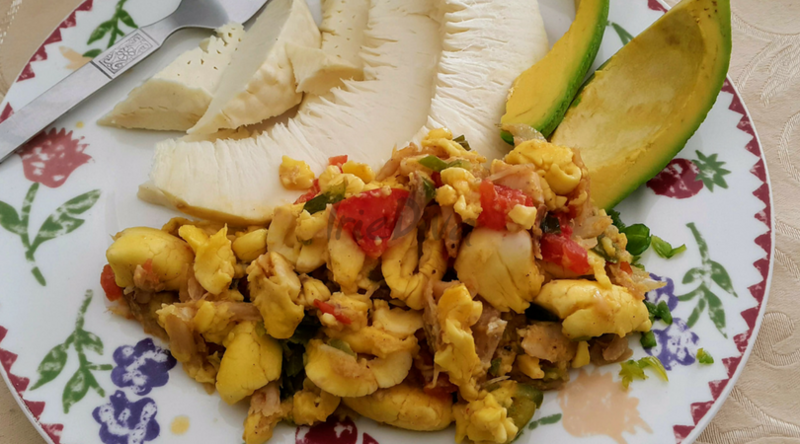 Have you ever had ackee and saltfish before? Will you be trying this recipe? Let me know in the comments below and please share this recipe with a friend! Bring a large pot of water to boil. Place ackees in water and bring water to boil once more. Allow ackee to boil for two minutes. Remove from hot water and set aside. If using tinned ackees, you should be able to skip this step. Refer to instructions on can. Boil saltfish for 10 minutes to remove extra salt. 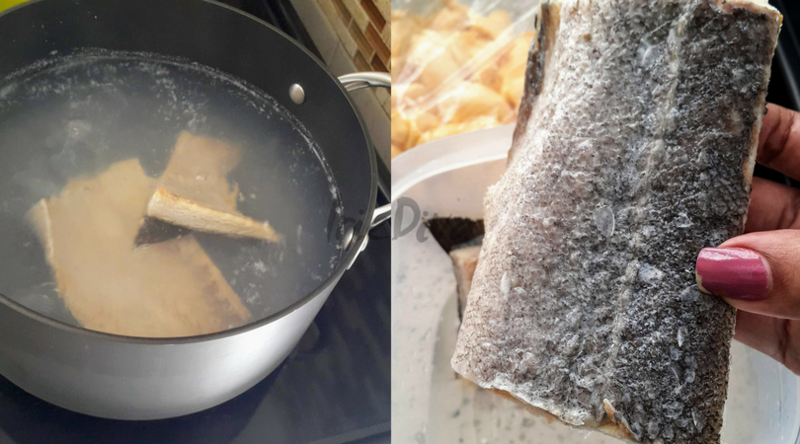 Allow to cool then clean the skin and remove any bones while in the process of shredding the saltfish. Chop all seasonings and heat oil in pan. Add garlic and onion to heated coconut oil. 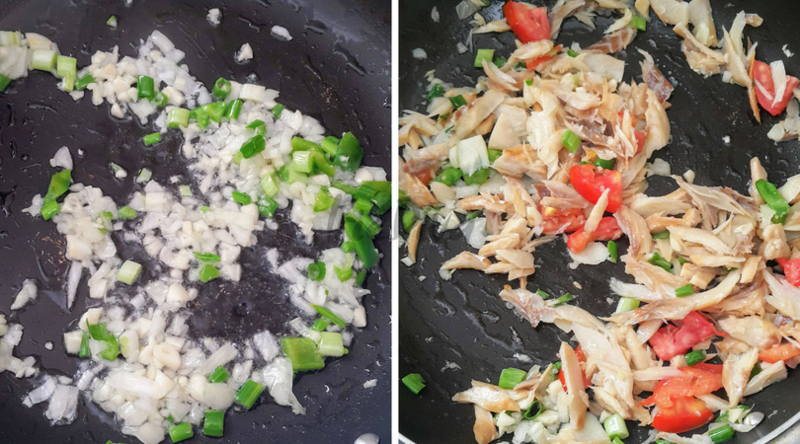 Once onion is translucent, about 30 seconds, add saltfish to pan and half of the other seasonings. Toss for a minute or two then add ackee to pan. Season with Island Spice Chicken or Jerk Seasoning and add rest of fresh seasonings. Gently mix all this together and allow to simmer over low heat for another 5-8 minutes until ackee is thoroughly cooked through. It will begin to sweat and create juices in the pan. Remove from heat and serve with desired side.